Electric foot massagers are a great option for those who want to enjoy relaxing, rejuvenating foot massages at home, but how do you choose the right product from the hundreds that are available? In this comprehensive buyer’s guide, we’ll discuss the benefits of electric foot massagers, why you may want to consider getting one and what features you should be looking for when purchasing one. Why Use a Foot Massager? Whether performed by a professional massage therapist or at home with a foot massaging device, a soothing foot rub provides many physical and psychological benefits beyond relieving stress and soothing achy, tired feet. Foot massage increases blood flow in the feet and calves which, in turn, can help alleviate arthritic pain and post-workout soreness. A 2014 study conducted by the University of Illinois at Chicago found that massage significantly improved vascular function in both active and sedentary adults. Foot massage can help alleviate pain not only in the feet and ankles, but throughout the entire body. A 2004 study found that massaging the feet activates nerve fibres that send a “non-painful” signal to the brain, thereby preventing transmissions of pain from entering the consciousness. Research suggests that foot massage promotes faster growth of regenerating muscle fibres, especially when the massage is performed immediately after a workout. Swelling of the feet and legs is a symptom of edema (water retention), a condition frequently experienced by pregnant women and individuals who sit for long periods. Foot massage has been found to be effective in reducing edema in the feet, ankles, and legs. While blood pressure can be lowered through diet and lifestyle changes, foot massages have been found to be especially effective in improving systolic blood pressure and triglyceride levels. Electric foot massagers and manual massage tools are convenient alternatives to professional therapy that allow you to enjoy the benefits of a rejuvenating foot massage anytime – whether you’re at home, in a hotel room, or even at the office. These devices are designed to mimic a variety of manual massage techniques, from reflexology to Swedish massage to Shiatsu. There are five basic types of foot massagers: manual foot massagers, electric foot spas, electric foot and calf massagers, leg air compression machines, and Shiatsu massagers. Foot rollers and massage balls are two examples of manual foot massagers. These manual massage tools are made from a variety of materials, including plastic, rubber, or wood, and often have spikes or bumps for massaging deep knots. These boot-shaped devices are designed to deliver deep, kneading massage to the feet and lower legs. If you are looking to get your calves massaged as well as your feet, an electric foot and calf massager may be more appropriate for you rather than a shiatsu foot massager. This is a general term given to foot massagers that use water. Foot spas come with a wide range of features, including massage rollers, built-in pumice stones, and heating functions. These medical-grade devices are designed to stimulate blood flow and reduce swelling of the feet and legs. Leg Air Compression Massagers are often used post-surgery, however many people buy them for relaxation purposes in their own homes. These massagers simulate the deep, kneading action of a therapists hands when administering Shiatsu, a Japanese therapy that involves applying pressure to the body using the fingers and thumbs in order to correct muscle imbalances. For the purposes of this buyer’s guide and review, we’ll be focusing on Shiatsu foot massagers. Below are a few things to look out for when shopping for an electric foot massager. Choose a foot massager made from durable, high-quality materials. While these massagers are usually more expensive, they are usually backed by guarantees and will save you money in repairs over the long run. A foot massager with a lot of confusing controls and settings will only frustrate you and prevent you from getting maximum enjoyment and benefit from your machine. Consider a foot massager with simple, foot-operated controls or a handheld remote. Some foot massagers simply need to be wiped down every now and then, while others need to be treated with a special disinfecting solution. When browsing through different product listings, be sure to take note of how easy the massager is to clean. Electric foot massagers have a lot of moving parts, so you’ll want to be sure to choose a model that is covered by a warranty. The highest quality foot massagers are usually protected by lifetime warranties. Foot massagers vary widely in price, from $10 for a basic foot roller to over $200 for a fully-featured electric massager. Generally speaking, the more expensive a foot massager, the more features it offers. It may be helpful to discuss your condition with your doctor before buying a foot massager in order to avoid paying too much for a foot massager with features you don’t need. Now that we’ve covered the basics about electric foot massagers, here are our reviews of the top foot massagers currently on the market. The Miko Shiatsu Foot Massager offers a number of neat features, including remote control operation, adjustable heat, and two different massaging actions (kneading or vibrating). The massager also has an air compression function that applies gentle pressure to the feet, helping to stimulate blood flow and soothe achy feet. The Miko Shiatsu Foot Massager provides an intense massage that may be painful for some users. Another downside is that the massager only accommodates feet up to size 12. Overall, though, users say the Miko Shiatsu Foot Massager works well to relieve soreness and relax tense feet. The NekTeck Foot Massager uses 18 massage noes on 3 massaging heads to deliver deep targeted massage to each of your feet. It also has an optional heating function and 3 height levels. Unlike the Miko Shiatsu Foot Massager, the NekTeck Foot Massager features an open design, meaning you place your feet on top of the massager rather than inside of it. Because of this design, feet tend to slide around on the unit during the massage. 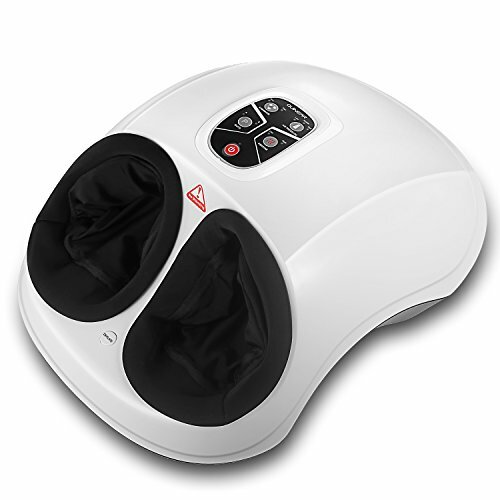 Those with sensitive feet will also want to take care when using the massager, as it provides deep kneading pressure. The manufacturer recommends placing a towel between the massager and your feet if the pressure is too intense. 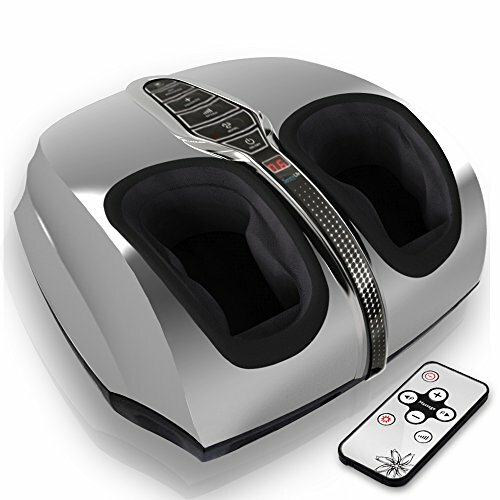 The Belmint shiatsu Foot Massager features a unique rotational massaging head that delivers three vibration intensities. The massager also has an adjustable heat function. One minor drawback of the Belmint Shiatsu Foot Massager is that it does not come with a remote control. 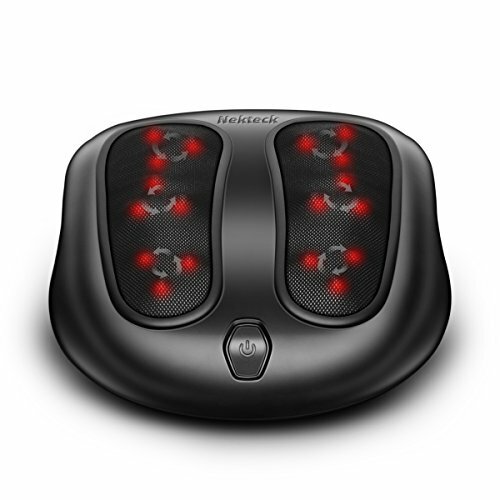 There is, however, a control panel that allows you to easily adjust the massage speed and pressure using your toe. The Belmint Shiatsu Foot Massager is not backed by a manufacturer’s warranty, but the company does offer a money-back satisfaction guarantee. 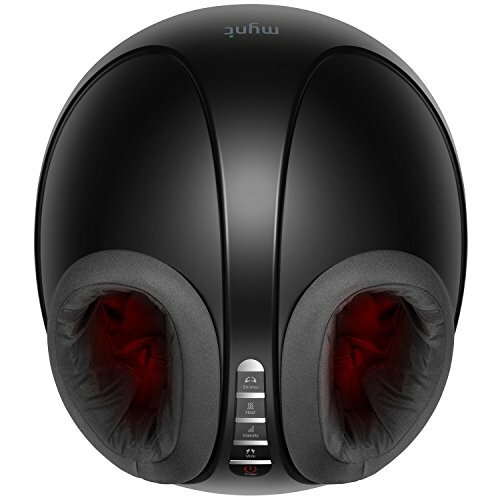 The Mynt Shiatsu Foot Massager is a premium foot massager featuring high-tech pads and rollers that deliver deep kneading massage from ankle to toe. Selectable heat, intensity and pre-set cycles allow you to create 20 customized massage experiences. This machine provides a deep massage that mimics the kneading pressure of a professional therapist’s hands, but for its high price, we’re a bit disappointed with the limited features. Despite this minor drawback, the Mynt Shiatsu Foot Massager is a great investment for anyone looking to supplement, or even replace, professional therapy with an at-home electric massager. 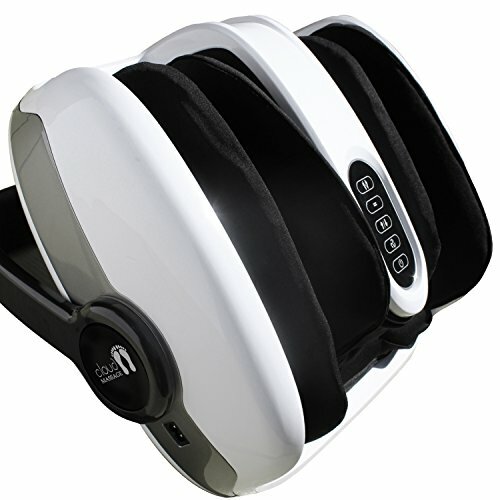 The Foot Massager by QUINEAR packs a lot of great features into a compact, lightweight package. Not only does it offer 6 different air pressure intensity settings, but it also has two heating functions, allowing you to completely customize your massage experience. The QUINEAR Foot Massager is surprisingly roomy despite its small form, but as with many massagers that feature a closed design, the QUINEAR Foot Massager may not fit those with large feet. This budget-friendly device features three rotating heads that allow you to target precise areas of the feet to soothe tense muscles. The massager also has an adjustable heat function that helps boost circulation. 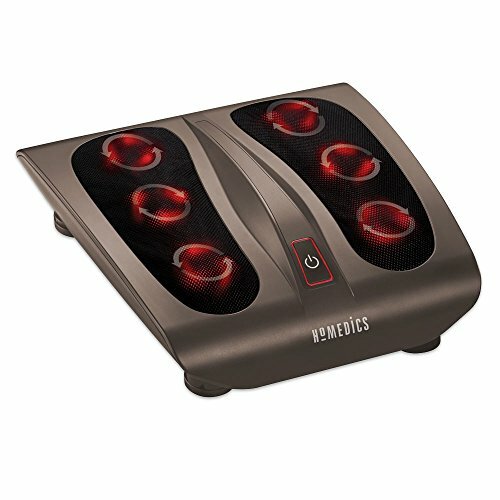 The HoMedics Triple Action Shiatsu Foot Massager with Heat is a good option for those with larger feet, as it accommodates all sizes, but those with deep arches may find it difficult to get their feet into the proper position for a deep massage. There is also an air compression function that provides a deep kneading massage that mimics the hands of a professional masseuse. Weighing just 10 pounds and featuring a built-in handle, this is one of the lightest and most portable units on the market. It may not fit wider feet, though, and diabetics are encouraged to consult with their doctor before using this product. A common complaint among users of electric foot massagers is that the massage is too rough, or even painful. 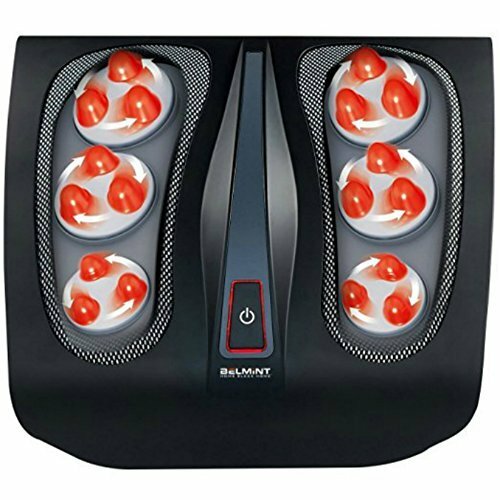 Those with sensitive feet will definitely want to check out this inexpensive machine, which features 18 rotating massage beads that are designed to deliver a targeted, yet less intense massage than other models. 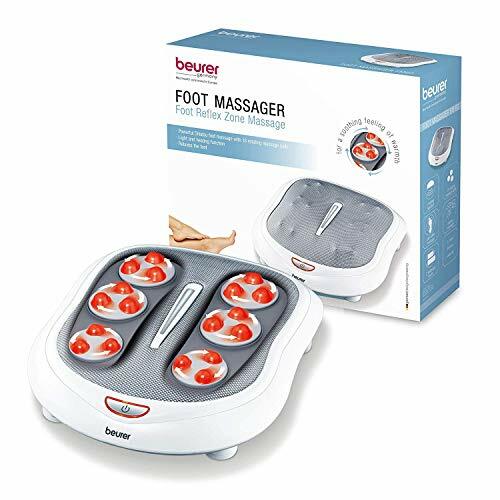 The Beurer Shiatsu Foot Massager also boasts an optional heat function, two speeds, and a breathable mesh surface. Unlike other foot massagers, which are designed to keep your feet flat on the floor and your knees together at a 90-degree angle, this innovative device keeps the feet, calves and ankles at the optimal angles for comfort. Its open-toe design means the massager fits any shoe size, and its 11-inch-long allows the massager to be worn in several different configurations – such as flat on a surface, in an angled position using the built-in kickstand/handle, or on the lower calves while laying on a bed. In terms of performance, this is one of the best massagers on the market. Its air compression function easily rivals the feel of a therapist’s hands, and the optional heat and vibration functions allow you to create over a dozen combinations of settings for a more personalized treatment. That said, the Cloud Massage Foot Massage Machine provides an intense massage that may cause some discomfort during the first few sessions. 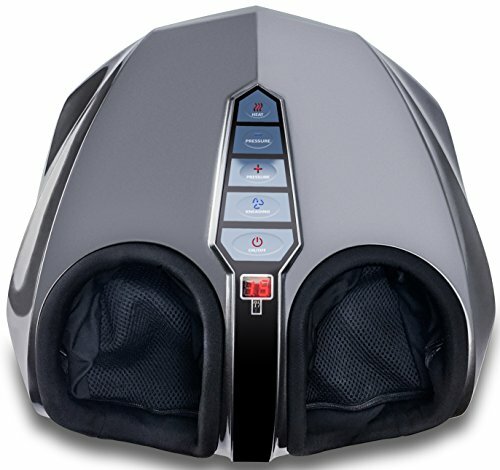 Unlike many inexpensive foot massagers on the market, which only massage the bottoms of the feet, the SereneLife Shiatsu Foot Massager delivers full-foot therapy using an air compression function that manipulates specific areas of the foot to relieve tension, ease soreness, and reduce fatigue. The massager includes a remote control for added convenience, and an LCD display that shows your massage and heat settings. The SereneLife Shiatsu Foot Massager fits feet up to size 13, making it ideal for use by everyone in the family, but some users have said that the massager doesn’t get warm enough to provide effective heat therapy. Despite being one of the more expensive options on the market, the Foot Massage Machine Shiatsu Massager by Cloud Massage comes out the clear winner. Its versatility, ease of use, and multiple massage functions make this device a great investment for anyone who is serious about enjoying the numerous health benefits of at-home foot massage. In this article, we’ve covered several different types of electric foot massagers and shared with you what, in our opinion, are the best ones currently on the market. Keep in mind, however, that foot massagers may not be effective for some and may even make certain conditions worse. If you’re experiencing persistent or severe foot pain, it’s a good idea to consult with your doctor to rule out an underlying issue.